In preparation for our upcoming Twitter chat this week on textbooks and open content, I'm going to be writing some posts about how I use — and reuse! — content in my classes. In particular, I want to focus on student-created content and how I reuse that from semester to semester. The Storybooks. Although I do have class readings, that is not what I consider to be the most important content of the class. Instead, the most important content in my classes is the content created by the students themselves. In addition to their weekly blog posts, the students create semester-long storytelling projects called Storybooks. 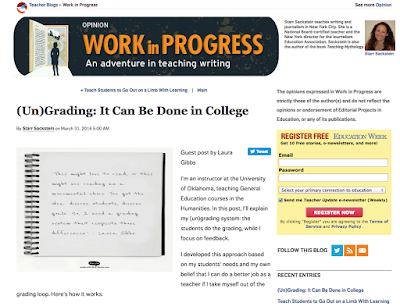 In this post, I'll explain some of the ways that I am constantly re-using my archive of student Storybooks to provide ideas and inspiration for the new students every semester. Then, in a separate post (this one is already too long! ), I'll show how this focus on the Storybooks as the central content of the course is an organizing principle that drives my whole approach to course design. First... some history. The students have been created Storybooks in my classes since 2002 using webspace (3MB per student) provided by my school. Sadly, my school's IT department deleted hundreds of the Storybooks in August 2010; it happened without warning just before classes started for Fall 2010, and that was the hardest semester I ever faced as an online instructor. Luckily, a few students had been using Google Sites already (mostly Study Abroad students working in Internet cafes who needed a 100% browser-based web publishing option), so in Fall 2010, I switched from recommending that the students use OU webspace and urged them to use Google Sites instead. That's proved to be a great choice. I'm now into my fifth year of students using Google Sites, and it's still working really well as a solution! 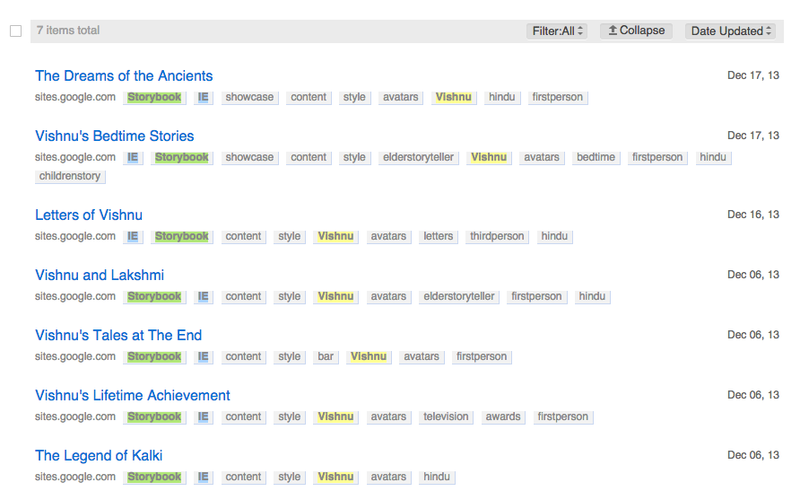 Most of the students leave their projects online after the class is over, and I've now got 600 Storybooks in my archive. E-Storybook Central. This is a Blogger website that is my main link repository. 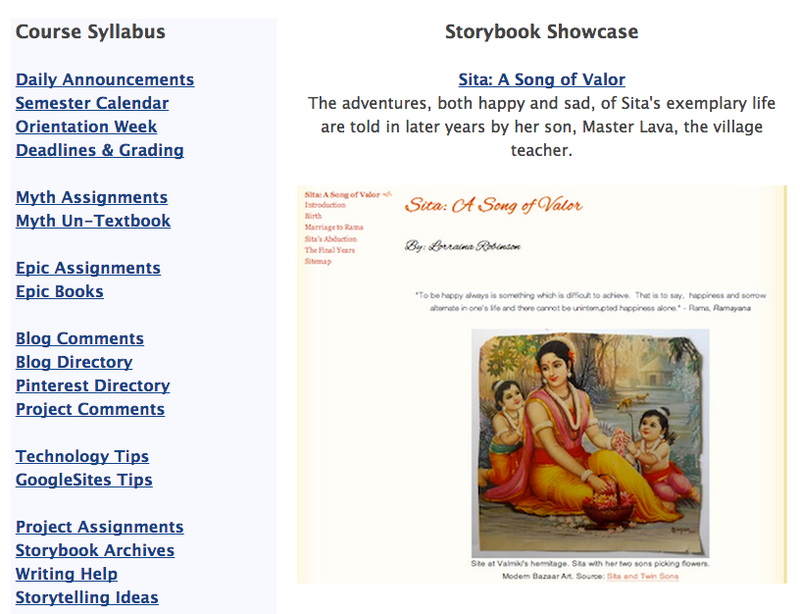 After each semester is over, I update the list of links for each class with the Storybooks that the students have left online: Myth-Folklore and Indian Epics. I don't keep track of the students' names as you can see; many of the students do put their names on their Storybooks, but that is their choice. All I need is the Storybook title. Daily Announcements. In addition to specific assignments that ask students to browse the Storybooks, I include a Storybook every day in the class announcements. Because there is only room for appx. 100 daily announcements in the semester, I run this list of links with a spreadsheet which I update at the end of every semester, adding in the Storybooks that seem like they would be especially useful to share in this way. My goal in sharing a Storybook every day like this is both to give students ideas and inspiration for their own work, while also reminding them all semester long that the Storybooks they are creating are as much for future use as for the present. 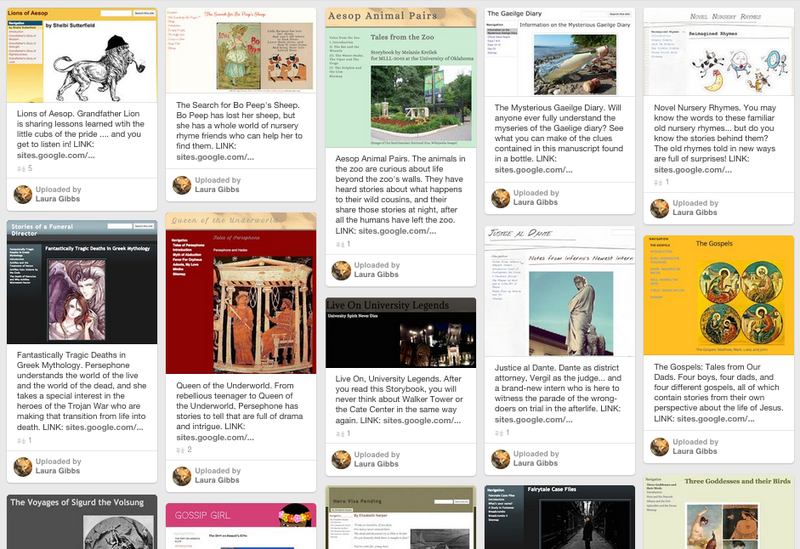 One of my projects for Summer 2015 is to transfer the most useful Diigo link lists to Pinterest Boards: I will keep using Diigo for myself because it is great for record-keeping purposes, but for the students, I need something more visually attractive. Since Pinterest will let me have up 500 Boards and 200,000 pins, I won't run into any limitations that get in the way: I really can have all the Boards I need! Plus, it is far more likely that students will grab and re-share Pinterest pins; I have never had any luck in getting students interested in using Diigo for their own research and bookmarking purposes. And, to be honest, I don't blame them. I use Diigo because it is powerful, but it's never really fun to use... and fun is a big motivating factor — not just for the students, but for me too! When I say that the student Storybooks are the most important content in my classes, I mean much more than content as "information" to be digested and regurgitated, as is so often the case with textbook content. The way students use the Storybooks is not to get information (sometimes that is the case, but not often). Instead, the students are using the Storybooks for ideas and inspiration as they develop their own projects that reflect their own interests. That's why it is so important that this is student-generated content. When current students see the work of past students like this, it sparks an "I can do that too" moment. I really need that spark because most of my students are not confident as writers, and most of them have never published anything online before. The Storybooks also show students that there are really no limits to the topics and styles they can explore. Sure, I can tell them to be adventurous in their brainstorming about topics and styles, but the enormous variety of the Storybooks shows them with examples more powerful than mere words from me. So: GIVE IT A TRY. This is the kind of effort that builds and builds over time, but it also pays off after just one semester. I love the fact that I now have hundreds and hundreds of Storybooks in the archive (all of which bring back happy memories for me as a teacher), but nothing so enormous as my archive is required for this content strategy to be effective. If you are thinking of doing something similar in your classes, even just one semester is enough to get a good start on a student archive, and in just two or three semesters you will have an archive that will be really exciting for students to explore. So, don't let your LMS consign your students' work to the digital trash can at the end of the semester. Instead, start saving it online, in open spaces beyond the LMS. Who knows: it might even turn out to be the most important content in your classes too!